Yes, it is already that time of the year again! Christmas will be before we know it and as some of you know every year Lindsey and myself host the Canadian Blogger Christmas Swap. It is 4 years and counting and every year our participant list grows! It is a fun way to get to know other bloggers and receive a Christmas package at the same time. 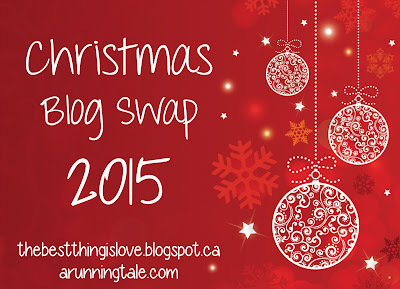 - The swap is only open to Canadian's with active blogs. Sorry US friends but shipping is pricey! - You must be willing to share the package your receive on your blog. - Leave a comment on this post (or Lindsey's) by November 10th if you want to participate. - The package must include an ornament and then whatever else you would like if you did not spend the whole $20. - Partners will be announced on both blogs the week of November 16th. I'd like to participate this year! Thanks! I want to participate again!! So much fun!!! Already commented on Lindsey's blog - but I'm in again! Already commented on Lindsey's blog too, and I'm in again! :) Thanks for hosting this! I commented on Lindsey's blog...but I'm in! Count me in for sure! You two are always so great for organizing it! Yay! It was a ton of fun last year, Count me in for this year too! I would love to be involved please, this is such a cute idea! I'd like to join in again this year too please!